Anyone who believes that the United States is immune to radical politics never attended a lecture by Howard Zinn. The rooms would be packed to the rafters, as entire families, black, white and brown, would arrive to hear their own history made humorous as well as heroic. “What matters is not who’s sitting in the White House. What matters is who’s sitting in!” he would say with a mischievous grin. After this casual suggestion of civil disobedience, the crowd would burst into laughter and applause. And of course, when he spoke about history, it was from the perspective of having written A People’s History of the United States, a book that has sold more than two million copies and changed the lives of countless people. 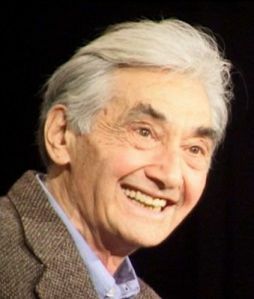 its possible that howard zinn died not due to age but from a broken heart. Nobody would be more disapointed in the lack of progressive reform coming from the obama administration than zinn…..and there arent many historian/author/activists outside of zinn who did more to help pave the way for obama to become commander in chief. i remember reading A Peoples History in my 11th grade AP History class. We spent almost half the school year discussing it, and I can only imagine how much crap Ms. Basso (kindest soul in the school…) took over the years for using it as the main textbook for the class. Having a handbook to help learn about being critical of our nations history – so that we dont repeat the same mistakes over time – was essential to my maturity and understanding of humanity. Know what ya mean. I just started reading it again over this last month or so. Howard Zinn was a real American hero . . . activist/intellectual . . . he could hardly tell the difference between the two. Lane, my daughter also read his book in High School . . . I’ve always thought it brought us closer between the generations . . . he was remarkable in his ability to stay contemporary and influence generation after generation of students. On top of that he was a person of amazing sweetness, compassion, empathy . . . when I was teaching H.S. for a few years in the Boston area I had the great honor of meeting him several times at movement events . . . despite being years older than everyone he had not the slightest hint of condescension of or superiority about him . . . not always the norm for academics of his era. And he was still so very active and engaged . . . his example of sticking with it for a lifetime . . . beliefs, principles, commitment to action . . . will stay with me as I enter my old age . . .
. . . by the way, way before People’s History of the US Howard Z. was writing great stuff . . . check out SNCC: the New Abolitionists . . .. probably out of print but available at libraries I’m sure . . . written during the civil rights struggles of the early 60s, as they were going on, it has as much perspective as anything written since . . . few white scholars had as deep an understanding of the developing black movement in this country as he did . . .
. . . and Lane, I am happy to say that HZ probably did NOT die of a broken heart . . . it was way too strong for that . . . if he was disappointed in Obama he was more likely to start thinking about the strategy that might help overcome that . . .
J.D. Salinger, 91, has died at his home in Cornish, N.H. on Wed. the same day as Zinn. Salinger was a celebrated author and enigmatic recluse whose 1951 novel “The Catcher in the Rye” became an enduring anthem of adolescent angst and youthful rebellion and a classic of 20th-century American literature. Zinn’s “Peoples History..” has been a high demand item in the City Library system throughout my 26 year tenure there. We couldn’t keep enough copies of it in stock. Those paperbacks fell apart or weren’t returned and each year more were ordered and checked again with a new wave of students. I would often recommend it. Catcher in the Rye, interestingly enough, has also turned up on college reading lists. I wonder how Holden Caulfield plays out today…. Newer Article: Has Obama Lost the Left? Why Is He Still Pushing Bi-Partisanship?